Designed to produce a range of spray droplets, from ULV (20microns or less) to a mist (50 microns and larger). 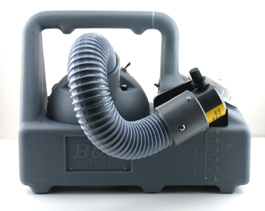 This hand-held fogger has an 18-inch extension hose that makes it the perfect tool for spot application of ULV or mist sprays in food preparation or storage facilities. The quiet two-stage motor (available in 110V or 220V) and the 1-gallon capacity make this fogger the choice of professionals around the world.